Swedish-born composer/producer Ludwig Göransson provides the roaring musical score for Black Panther, the 18th film in the Marvel Cinematic Universe (MCU). 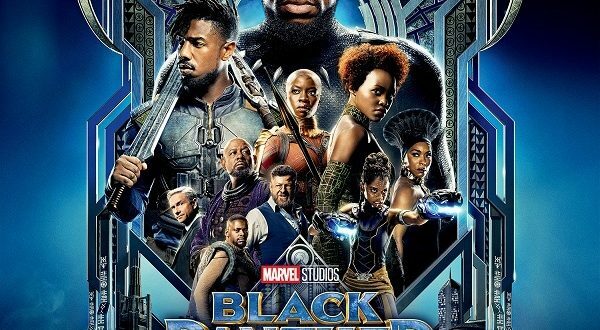 Directed by Ryan Coogler (Creed, Fruitville Station), it stars Chadwick Boseman (Marshall, 42) as T’Challa / Black Panther and co-stars Michael B. Jordan, Lupita Nyong’o, Danai Gurira, Martin Freeman, Daniel Kaluuya, Letitia Wright, Winston Duke, Angela Bassett, Forest Whitaker, and Andy Serkis. The score is a match for this epic action-filled superhero adaptation of Stan Lee and Jack Kirby’s comic book series and impressive African culture showcase. Göransson drew upon the International Library of African Music (ILAM) for his impressive 135-minute, 28-track musical score for Black Panther. The score features a 132-piece western classical orchestra, African percussionists, and a 40-person choir. The score is so sizable because the composer created enough music for a four-hour director’s cut of Black Panther. “Wakanda Origins” begins the score compilation with fast rhythms, while “Royal Talon Fighter” kicks in more epic movements that incorporate large horn and string arrangements with African beats and has a strong ending. “Wakanda” features a great vocal beginning that initially sounds like Lebo M., but is actually Senegalese singer and guitarist Baaba Maal, who has a writing credit along with Göransson on this memorable work. The intermittent drums and swelling orchestrations complement Maal’s voice perfectly, and the rhythms, choir, and orchestration provide a grand ending. “Warrior Falls” has an outstanding first half with vocals and chants, then features sustained but quiet orchestration with intermittent percussion. “The Jabari” is a tribe theme with a longer reprise near the end, which is good since this one lasts only about one minute. “Waterfall Fight” has great choir arrangements in the second half with a royal, victorious tone that’s epic and infectious. Then the four-and-a-half minute “Ancestral Plane” really tugs at the emotions with effective strings. “Killmonger” builds to an even higher emotional level with several signature instruments – the talking drum, fula flute, and amazing trap hi-hat. “Phambili” follows with a loud second half building on the previous rhythmic work and percussion movements. “Casino Brawl” matches an action sequence while introducing a truly great repeating female vocal (beginning at 2:36) that lasts only 20 seconds, but repeats later in the score. It’s so memorable, and the pounding orchestral arrangement enhances the emotional effect even more. As in all the other memorable movements, this talented composer does not repeat much and knows when to transition into more rich music. I could listen to that section on repeat for hours. The “Busan Car Chase” continues fast-paced rhythms. “Is This Wakanda?” echoes “Ancestral Plane” with quiet emotion and building tension. The five-minute plus “Killmonger’s Challenge” brings back that signature hi-hat with flute, strings, and echoing percussion. Then “Killmonger vs. T’Challa” powers through the emotion of an event that sets up the film’s climax. “Loyal to the Throne” leads into a great second-half of xylophone work and percussion, which ended a bit too soon. “Killmonger’s Dream” takes on more quiet, traditional orchestration; then “Burn It All” layers strings and haunting vocals with the hi-hat again – all effective, but the talking drum really makes the most impact here. “Wake Up T’Challa” quietly reverberates and ebbs for over six minutes, reflecting the impact of a key sequence in the film. “The Great Mound Battle” and “Glory to Bast” ramp up the action based on quick-rhythmed percussion. “A New Day” pulls the heartstrings again with epic orchestration. The playful yet hopeful “Spaceship Bugatti” packs in more emotion, while “United Nations / End Titles” is basically a curtain call for all the themes, familiar movements, and powerful rhythms. The amazing blend of African percussion (e.g. sabar drums) and chorals fuse well with several orchestration styles for some satisfying and unpredictable musical experiences. This score from Marvel Music / Hollywood Records comes highly recommended (3.5 stars out of four) and is available on digital and compact disc. Also available is the song soundtrack, titled Black Panther: The Album featuring Kendrick Lamar with songs from the film (three total including “All the Stars” by Lamar and SZA) and inspired by it.